The Leela takes its wine seriously. Every other month my mail box is graced with an invite to one of their four course wine or whisky dinners. 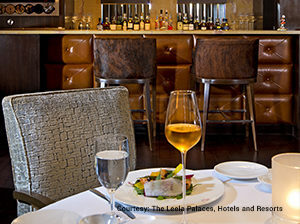 Recently I stumbled upon an invite to the Chateau Timberlay Wine Dinner at Le Cirque and I reserved a spot for myself. The dinner was priced at 5,500 + taxes for walk-in guests and a discounted price of 4,500 was applicable for all Connoisseur Club members. I was glad to know about the special price for membership holders since events like these are usually extremely exclusive and do not honour discounts. I was no stranger to Le Cirque, Mumbai. I had relished their Franco – Italian cuisine many a times and always looked forward to special occasions to experience their menu again. This time around the dinner service was an epicurean adventure spread over five courses of sumptuousness. It was an evening of exquisite wines from the House of Chateau Timberlay paired with a carefully curated food menu by Lorenzo Severeni, Le Cirque’s Head Chef. Staring with delicately flavoured lighter wines, the evening dinner progressed to more intense and bold flavours. The wine dinner was a phenomenal experience! I got to learn a lot about wine in general and its pairing with food. If it wasn’t for my Connoisseur Club membership, I wouldn’t have ever thought of reserving a table for a wine dinner and would’ve missed a delightful experience. 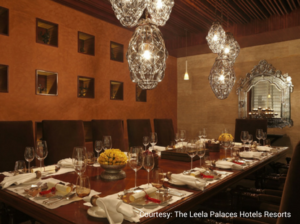 Wine dinner at The Leela is a must for all wine lovers. Try and get a membership to the Connoisseur Club for invites to similar exclusive events and offers on dining and accommodation. 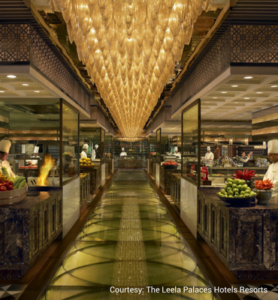 Connoisseur Club at The Leela Mumbai comes with up to a 50% off on food, 15% at the Spa, complimentary meals, cake, wine and room stays.